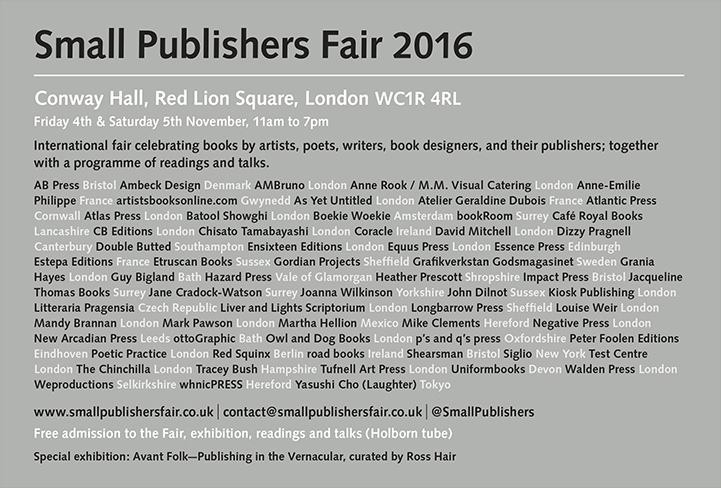 Negative Press London will be taking part in the Small Publishers Fair 2016 taking place at Conway Hall, Red Lion Square, London WC1R 4QL, Friday 4 and Saturday 5 November, both days from 11am to 7pm. We are delighted to be sharing a table with Michael Atavar from Kiosk Publishing. All Negative Press books will be available to purchase, including In Camera by Nicholas Royle and David Gledhill, as well as rare archive copies of Still and Strong Room (Roelof Bakker and Jane Wildgoose) and Roelof Bakker’s self-published photo book, How Many Hopes Lie Buried Here Mother (edition of 50). An A2 collector’s poster of new hand-drawn stones by Martin Crawley (Placing Stones) will also be available alongside a limited edition set of postcards of Hornsey Town Hall from Roelof Bakker’s extensive Hornsey Town Hall photography archive. Interesting – worth a dash down on the train!